Let’s just say an 8-year-old has hoodwinked me. I had to pick Clara up a couple times from school last week only to discover she’s been a typical kid and eating her dessert and fruit for lunch and sharing the rest of her meal after school. All I could do was bust out laughing. I mean really, this is my doing. I've learned something though. From now on I’m only packing her a small treat. At least the bus kids are getting some healthy food. Hey, someone has to eat it! Week of May 17th-May 21st 2010. Clara was getting tired of change for her main meals, so I’ve started repeating her favorites. It’s kind of sad when a child has to ask for a pb&j sandwich! Large covered container- Spaghetti with grilled veggie marinara sauce & Parmesan. On the side- Sandwich bag with red grapes, 1 fortune cookie. Foil- 1 large carrot, not cut up. Large covered box- Spinach with baked & chopped MorningStar Farms Chik Patty & cheddar cheese. Small uncovered box- Mini covered container of bleu cheese dressing. Mini covered container shelled sunflower seeds. Medium covered box- Mini bagel with ham. Medium covered box- Banana slices and grapes layered with plain yogurt mixed with huckleberry jam. That stinker! My oldest recently told his younger siblings how I used to number the items in his lunch so he'd eat them in the proper order. He claims to have followed my instructions religiously - he was always my good kid. Son #2 would have laughed in my face if I tired such a thing. Needless to say, Clara is very lucky little girl! Yeah Patricia I was kinda dumb lol! I think it's kinda cool you numbered the items in the lunches! I'm just amazed though that your eldest followed directions! LOL! You honestly thought she was going to eat lunch first ~! Gotta love it! I swear that girl eats the best lunch ever. Lol. How cute. 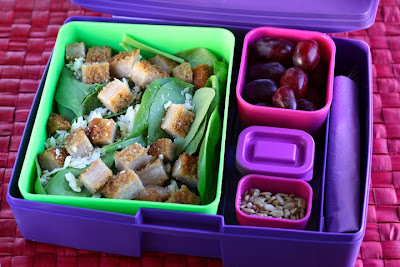 I love the lunches your prepare for her...so healthy and yummy! I can't wait to have kids just so I can pack their lunches. Thank you for sharing! LOL! I can remember doing the same thing. Loving the Bento/laptop lunch box. I think I may get one for dd as she is starting school next year. Love all the great lunch ideas! How clever :) Our school doesn't allow them to share food (threat of allergic reactions), so I'm pretty safe :) She's hungry by lunchtime anyway so she has to eat whatever's in there. Great lunch for your daughter! Nice to see a mother preparing a heathy meal at home (so many mother's fail to do this today). 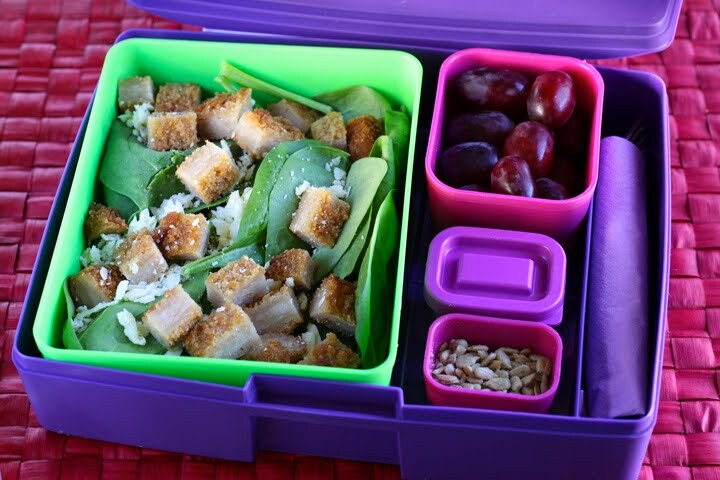 I have GOT to get a laptop lunchbox for Gabby! I don't have to pack her lunch every day but for the days I do it would make it so much easier. Thanks for all the ideas!